In 2008, California passed Proposition 2, specifying confinement space for certain farm animals. Proposition 2 went into full effect January 2015 and has significant implications for egg production in California and possibly even interstate commerce. We examined the influence of promotional videos aired during the campaign on consumers’ willingness-to-pay for eggs produced in a more open production system (i.e., cage-free, free range) and corresponding neurofunctional activations during decisions. Forty-six participants (24 females), aged 18–55 years (M=29.65), were enrolled and performed a food decision-making task during fMRI scanning. In each decision, two options of identical one dozen cartons of eggs were presented simultaneously. Below each option were two attributes, describing price and production method. Cage free and free-range eggs were more expensive, at varying degrees. Participants were randomized to one of three 30-second video groups: pro-Proposition 2, anti-Proposition 2, and a Neutral flowing stream. Based on a whole brain analysis, participants in the pro-Proposition 2 video group (N=16) demonstrated significantly greater activations post-video compared to pre-video in left insular cortex and right occipital cortex. This change in insula activity may be indicative of increased social risk involved with the purchase of closed production method eggs, driving participants to increase their percentage of decisions to purchase the higher priced, open-method eggs. 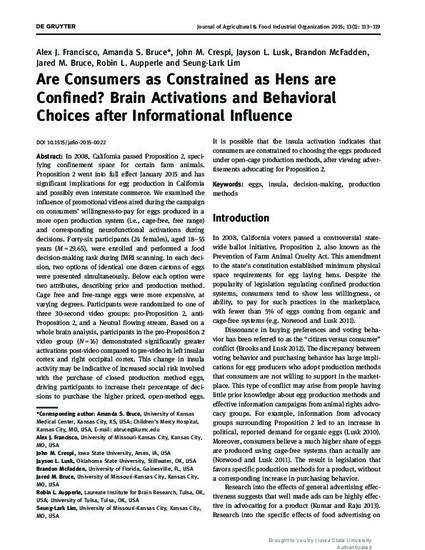 It is possible that the insula activation indicates that consumers are constrained to choosing the eggs produced under open-cage production methods, after viewing advertisements advocating for Proposition 2. This article is published as Francisco, A., A.S. Bruce, J.M. Crespi, J.L. Lusk, B.R. McFadden, J. Bruce, R.L. Aupperle and S-L. Lim. “Are Consumers as Constrained as Hens are Confined? Brain Activations and Behavioral Choices after Informational Influence.” Journal of Agricultural & Food Industrial Organization 13(2015):113-119. DOI: 10.1515/jafio-2015-0022. Posted with permission.